Players use the MOTI™ Mobile App as a stand-alone instructional tool to learn Soccer Foot Skills right at home. Players can learn and refine these Foot Skills thru interactive 3D animations that captiavite and inform the Player of how to do these moves, where to use them in a senario, and how to master these Foot Skills. Using our MOTI™ Mobile App, your player will log-in and use our 23 Gender Specific 3D Foot Skills and 6 Single Player Drills organized into progressive practice plans: Foundation, Advanced and Premier. The ONE PLAYER edition is only $19.99 and includes a 10-day trial. 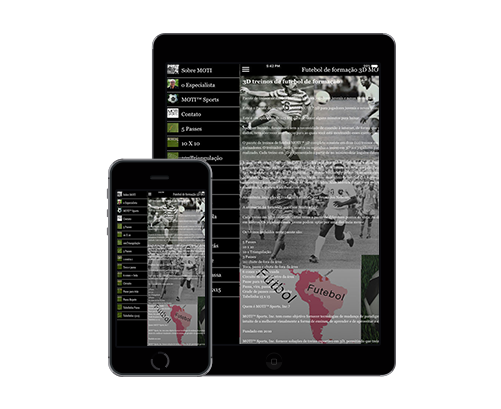 Download our MOTI™ Mobile App for FREE from either iTunes or Google Play Store. Register for our FREE trial. Hand the App to your player with a ball and watch then have fun and learn! Após ser baixado, funcionará sem a necessidade de conexão à internet, de forma que você não irá sobrecarregar o seu plano de dados, nem aborrecer as crianças para as quais você está mostrando esses exercícios. 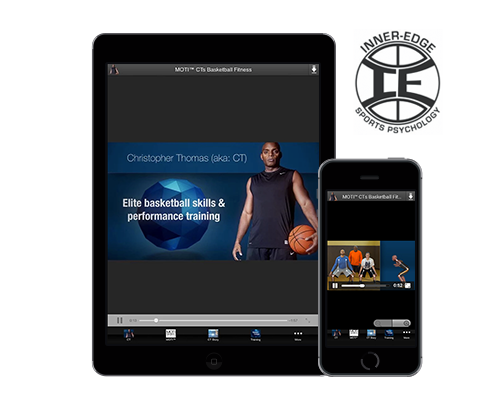 Christopher Thomas ("CT") and MOTI™ Sports, Inc. created this pilot app of a 4 week elite basketball training program to determine the level of interest by audience in such a series. Targeted at those players that want to excel, this 4 week training program will enable them to "push beyond" where they've plateaued and is intended for those players working towards achieving an Elite level of play. All age groups and skill levels will benefit from this training program. The App will provide you with a background of CT, whom for the past 14 years has changed basketball training to incorporate sports science of functional movement with fundamental basketball drills and exercises to bring a new level to performance training. All 3D Drills are designed and narrated by Soccer Professional Player and Coach Alan Merrick, who played professionally with England Club West Bromwich Albion and Peterborough and in the USA for the Minnesota Kicks, Los Angles Aztecs, San Jose Earthquakes, Toronto Blizzards and Team America. Alan Merrick has coached professionally Minnesota Strikers, presently coaches University of Minnesota Men's Club Team, as well as the Minnesota State Men & Women Select teams in multiple decades.